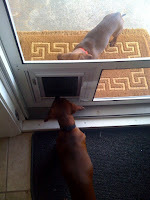 TL and I have been so excited about a brand new doggie door in our screen so the boys can go outside and play when they want to. Zeus had no trouble -- he was flying in and out of that thing in no time. He follows us inside and out. Maximus, on the other hand, has hit a depression. He is scared to death of the doggie door and refuses to go through it. In this picture, Zeus is trying to talk him in to coming through. Zeus is in the black collar inside the house, and Maximus is outside. We've tried everything- treats, praise, Zeus showing him, ignoring him and making him figure it out for himself. The poor little guy is really taking it hard!